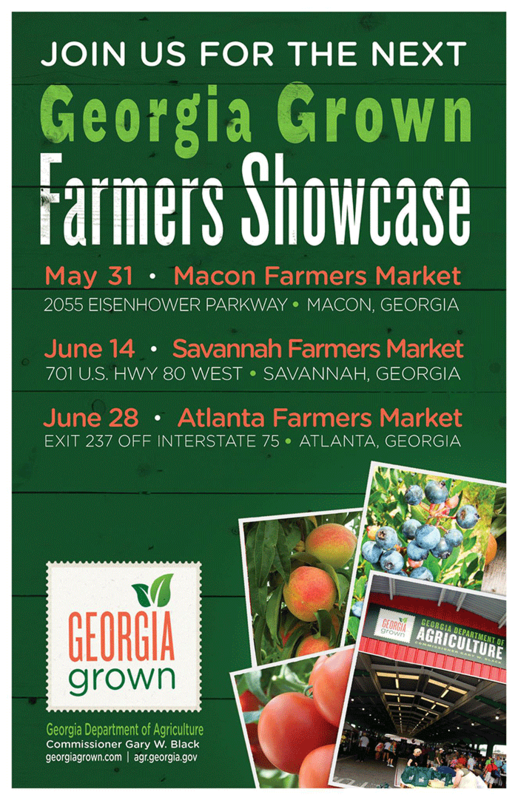 Following the success of last year’s Georgia Grown Farmers Showcase events, Agriculture Commissioner Gary W. Black announced today these events will be returning this summer at the State Farmers Markets in Macon, Savannah and Atlanta, along with the addition of a new event in Moultrie. The Showcase events are aimed at increasing the consumer retail experience at the State Farmers Markets as they bring together farmers and producers with consumers in the region. Market visitors will find a wide range of locally grown seasonal fruits and vegetables, as well as pork, beef, poultry; plants, flowers and other nursery items; olive oil, jams, jellies, barbecue sauces and honey; and baked goods and other prepared foods. In addition, visitors will find unique Georgia made soaps, candles, beeswax lip gloss, candy and other items. In addition to Georgia produced goods, there will be activities for kids and adults such as a watermelon seed spitting contest, food safety tips, a tractor show, kiddie train and much more! Visitors will enjoy free parking and free admission at each event.